“Form follows function — that has been misunderstood. Form and function should be one, joined in a spiritual union.” Frank Lloyd Wright (1869 – 1959), 1908. Synopsis: The objective of this article is to introduce information technology services business principals to a framework that will help assess opportunities for overall business performance improvement measured by gross profit margin and net pre-tax income as a percent of revenue. Information technology service organizations are simple to describe. At their essence the objective of a technology service organization is the delivery of subject matter expertise through a disciplined process to clients within a defined target market. The more discrete the IT service organization’s target market in terms of client size and industry concentration, the easier it is for an IT service organization to ensure their subject matter expertise is effectively organized around high-demand client requirements. Optimal technology service organization structures and practices are no secret. Top performing technology service companies embrace many common business structures and processes. It is interesting to note that IT service leaders that operate firms that perform in the top quartile often indicate they independently evolved to their set of organizational structures and best practices. The good news is firms are not condemned to learn these lessons through expensive trial and error experience. Technology service leaders also report they have adopted the best practices that have led to their sustained high performance after gaining knowledge of successful models. Developing a high performance IT service organization (see 4th quartile, RMA Annual Statement Studies) that sustainably produces a 20-25 percent net pre-tax income and a 20-30 percent revenue growth is a complex process. Improving the performance of an information technology service organization starts with developing an understanding of the optimal form or structure. Next is the effort to measure what it is that an IT service organization is trying to optimize by adopting the appropriate managerial accounting standards and time and charges reporting disciplines. These standards and disciplines will make it possible to expose the key performance indicators (KPIs) and business metrics. Once the accounting and time posting discipline are in place, and the KPIs and metrics are regularly published, management will be in a position to align all the processes of the services organization to the objective of optimizing those performance measures. This final sequence is a contextual effort, with each layer of successful process improvement initiatives making it possible to effectively address the next. Regardless of how an IT service organization evolves to best practices, it is well worth the effort. When these structures and practices are effectively embraced and implemented by technology service organizations, these practices lead to improved business performance, mitigation of business risk, and improved business value. The two prevalent models for IT technical or professional services organizations are: IT product service model (e.g. product-related consulting leading to product-related services) or IT professional service model (e.g. practice-related consulting leading to a variety of related practice engagements) One of the key differences between an IT product services group (or PSG) and an IT professional service organization is the degree of freedom from proposing only product-related services, such as assessment, configuration, implementation, or customization. If an IT service organization is associated with a product manufacturer (e.g. independent software vendor or ISV) and provides only services associated with the product(s) sold or developed by the company, it is a product service group (PSG). Constrained by what is possible within their product / service solution, PSGs work from client requirements only within the context of the specific technology-based solution. An IT product service business that is certified by an ISV or many ISVs to sell and service an IT product(s) is often called a "value-added reseller" or VAR. In contrast, professional service organizations start with client requirements and business processes and work back to a set of optimal solutions. The degree of service delivery freedom is constrained by their practices, subject matter expertise, and vendor/subcontractor alliances. The client recommendation made by the professional service firm is theoretically informed only by their subject matter expertise, the industry’s best practices, business process optimization opportunities identified by analysis, and the nuances and constraints of the client’s requirements (preference, budget, risk tolerance, etc). Product and professional service firms with less than a sustained 10 percent revenue growth may have difficulty managing a number of intrinsically connected critical areas, including: Key associate retention Enabling technology platform and system capital expenditure (CAPEX) Practice research and development New client engagement Services delivery productivity and quality Rate increase (effective or hourly) Brand reputation, and Net pre-tax income performance Top performing IT product and professional service organizations sustain 20-25 percent net pre-tax (NPT) income to revenue. Highly effective product and professional service organizations grow revenue at 20-30 percent compounded annually. In the pursuit of an optimized business model, successful technology service firms that deliver subject matter expertise (SME) must develop three fundamental structural components: SME-based client engagement and pre-sale consulting (i.e. Responsible for arranging client relationships, developing opportunities, and coordinating the leadership and SME resources to formally engage the client in a statement of work (SOW)) SME-based service delivery management and service delivery (i.e. Responsible for defining client engagements, and managing the formalized (SOW) delivery effort to a success completion) SME resource level management (i.e. 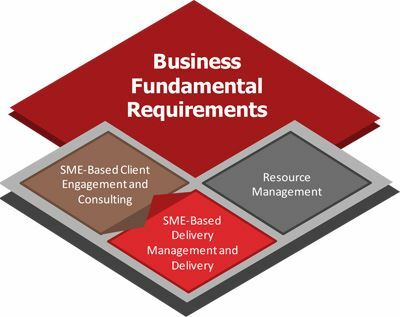 Responsible for ensuring the firm has access to the SME resource level necessary to meet client demand within the promise of the brand) Combining the three organizational components from figure 1 (below) into an interactive whole is fundamental to a top performing IT service organization. SME-based client engagement and consulting as well as delivery management and delivery organize their expertise around “practices” (i.e. documented process, subject matter expertise, and related knowledge areas). These practices emanate from what their clients value and are typically named after broad categories of client requirement. Furthermore, these practices are delivered using documented delivery disciplines and methodologies (e.g. professional project disciplines such as Carnegie Mellon’s Capability Maturity Model Institute level X.0). It is extremely difficult to deliver greater than a 20% NPT profit without developing an effective resource management solution. Resource management is the structure that ensures there is never too much or too little SME resource to address the required level of billable effort. The two keys to product or professional service resource management are core team size and flexible resource access. The appropriate core team size ensures high employment security of the organization’s most important resources. This employment security helps protect critical domain knowledge that is necessary to delivery effectively on client requirements. Flexible resource access provides: (1) Effective delivery within the promise of the brand, and (2) Net Pre-Tax income plan attainment. First level resource management approaches include adding interns or career apprentices (i.e. new grads, uncertified personnel), or para-professionals to a team, and then dividing tasks based on the highest and best use of resources. More advanced resource strategies use staff or contract recruiters to find contractors and contract-to-hire (C2H) solutions. Immediately accessible virtual guilds (trusted or certified subcontract network) and permanent quality off-shoring / near-shoring solutions take flexible resource access to a more predictable level of quality. Some of these approaches require advanced platforms to effectively manage and coordinate global and virtual resources. Resource management is fundamental to optimizing profits in both product and professional service models. To do this, it requires that a core team of employees cover a minimal level of effort (e.g. less than 70 percent of the level of effort) and uses a “flex-force” or lower cost force to address effort variations (e.g. greater than 30 percent of the workflow). Effective resource management mitigates or eliminates an unused bench of developers and realizes an optimal echelon of gross profit (GP) -- which should reach a minimum threshold of 50-56 percent of revenue range to begin to be defined as "optimal". Integrating the client engagement team with the service delivery team and the resource management team can bring about substantive advantages. The client engagement team (e.g. sales and pre-sales consulting) and the service delivery team (e.g. project management and software development engineers) must be structurally converged when: (1) The business’s market address is up-market (i.e. enterprise, mid-enterprise, enterprise division) (2) The product and associated services delivery knowledge is complex. These two conditions trigger the need for a tight integration of service delivery, consultant-skilled sales personnel, and pre-sale sales engineers. The integration is manifest in practice expertise, reward and recognition, and engagement terms checks and balances in the formal engagement process. In structures of this nature, the sales and pre-sales engineering personnel must have deep subject matter expertise in the service practices that are managed and delivered by the IT services organization. Sales should receive incentive compensation on actual gross profit margin produced when sales arranges a client relationship, develops a service opportunity, and the client is formally engaged with a statement of work. Appropriate engagement checks and balances must exist between sales and service on complex project sales. The sales organization is responsible for arranging client relationships, and for coordinating the effort that results in the formal client engagement. However, the service organization must be responsible for the estimating level of effort with a discipline that ensures that within a high probability that the gross profit margin targets will be achieved. Service delivery management must control the project estimate and pricing terms of the client engagement if they are to be accountable and rewarded for delivering the gross profit margin results. However, if sales opportunities predictably flow from product (e.g. software license) sales activities—and those service opportunities can be easily arranged over to the services team—there is often no need for the product license sales team to have a tight alignment to the product (software license) services group. In these cases, there is no advantage to a tightly aligned product and service sales force. This is often the case with a software licensed sales model that targets the small-medium business (SMB) segment. The SME-based client engagement and consulting (i.e. sales) and Delivery Management and Delivery (e.g. PMs and software engineers) can also be intimately aligned to the Resource Management structure. One approach to accomplishing this convergence is the implementation of an “IT staffing” team / practice. An IT staffing practice not only applies best-practice disciplines to recruit and fill the service company’s internal staff position openings, but additionally provides the staffing service on a fee basis to clients in the service firm’s target market. As a result, the IT staffing practice provides the service firm an opportunity for entry level client engagements (i.e. IT staffing services), that in some instances can be up-sold into more complex service practice engagements. Moreover, any labor shortfalls that successful up-selling into new project engagements may create will have a higher probability of being filled with quality new hires. The IT service firm’s probability of quality new hires will improve with this level of structural convergence because a staffing practice will develop: (1) an intimate knowledge of the information technology labor market and (2) extensive expertise in effective hiring disciplines. For organizations to achieve optimized service organization value, performance objectives need to be established (Note: RMA Annual Statement Studies is the industry standard; see 4th Quartile) and current practices compared to best practices. This process will identify current-to-best practice gaps. Improvement opportunities can then be prioritized based on criteria including cost, return on investment, time to implement, and probability of success. After effectively structuring the service organization, an organizations first step in the alignment process is to achieve strategic integrity – a tight alignment of the business (i.e. the service practices delivered) to target market (i.e. what the client values). An intimate understanding of the target market enables an organization to align what clients value to consulting and service delivery capabilities, and then to an engagement approach. Perhaps counter intuitively, in a service organization this is not done from executive, to sales, to the service structure. Instead, alignment works from what the market values back to practice definitions and eventually up to the sales approach (specifically, from what clients value, to service practice definitions, to consulting-ware, to sales process, to sales training, to sales materials, marketing programs, and website). Any breakthroughs in efficiency and quality relative to competitive standards need to be distinguished in the engagement process, and reflected in the service organization’s pricing strategy. At the most fundamental level, the alignment process is anchored in the concept of pre-programming the organization to achieve 4th quartile performance levels. This requires (1) establishing the net pre-tax income objective, (2) then forecasting revenue and cost of services sold, and only then building the selling, general, and administrative expense (SG&A) budget and the associated policies that affect expenditure (starting with the pre-sales budget and sales compensation/incentives). 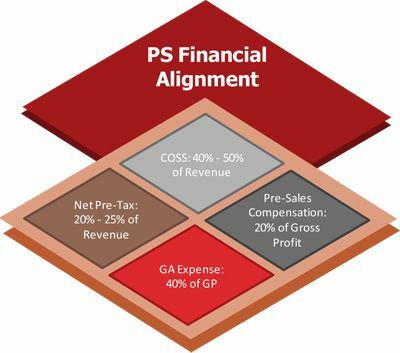 Net pre-tax income performance is a result of a planned objective, an accurate forecast, management of cost of services sold (COSS), and then aligning SGA and expense policy to that net pre-tax income objective. The precursor to effective professional service financial measures is an appropriate managerial accounting standard for a service organization. It is useful to place 100 percent of project management and billable service delivery personnel above the gross profit line into COGS (which should be more appropriately called Cost of Services Sold, or COSS). When professional services personnel are used in division-to-division efforts, there are clear managerial reporting advantages of using inter-company transactions (e.g. AP-AR entries will be eliminated at the consolidated level). In-division pre-sales billable personnel can be tracked in the time and charges system and transferred below the Service-co P&L’s GP line to sales expense or marketing expense. In early stage service companies, this discipline will help report the trigger points for hiring dedicated sales support personnel, such as sales engineers and others. The Key Performance Indicators (KPI’s) and metrics used to measure and manage the business need to be instantly available on reports and dashboards, and they should reflect suboptimal/optimal financial performance and productivity. Time, charges and financial systems have to accurately produce the critical professional services metric(s) and KPI’s. These KPI’s and metrics include: Utilization, realization, and optimization (The gold standard metric is realization.) GP percentage of revenue Average GP production (i.e. GP/total service personnel Head Count) Cost of Services Sold (COSS) percentage of revenue Total sales and marketing compensation and expense as a percentage of GP Non-sales and marketing G&A as a percentage of GP NPT income % of revenue New client revenue relative to existing client revenue Q-Q revenue; Y-Y revenue At this point, the real opportunity for IT professional or product service company optimization begins. The metrics and KPI’s will indicate what is out of tune and expose the next layer of alignment opportunity. Business process and policies can then be reviewed and changed to address specific issues. What are the critical questions? Is there at least a 50-56 percent GP attainment range (i.e. The minimum range)? Are the sales arrangement and client engagement processes and policies producing suboptimal GP results. (Are client expectations met)? If rates per hour and billable hours are optimized for the existing staff level, would at least a 50-56 percent GP be attained? If current service team productivity is below 100 percent realization, what is the remaining capacity? What are the reasons for the difference in real and theoretical capacity? 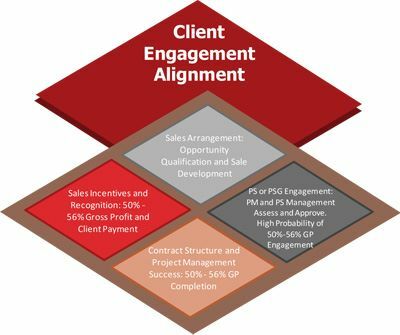 Do sales compensation programs reward profitable sales engagements or are there recurring experiences where a project produces a suboptimal GP production level (suboptimal effective rates per hour), yet sales representative reward occurs (i.e. sales incentives and incomes remain optimized on a non-profit or low profit transactions base)? Finally, the lowest contextual layers can be peeled back to evaluate and correct the root causes of the suboptimal process: Are the service processes aligned? e.g. Assessment/estimate, client expectations/engagement, daily time posting, billing terms & cash flow, and project control. Is sales only arranging the sale (prospecting, sales process, coordination of relationship, opportunity management) and (hopefully) not engaging the sale (assessing, estimating and approving agreement terms)? Accountability aligns to project managers (PM) and development team leaders only if they control engagement terms. Is effective rate or billed price per hour aligned to gross profit objectives? Are pay and benefits aligned to the appropriate industry percentile (i.e. 75th percentile is appropriate for domain knowledge holder protection)? Are productivity objectives reflected in individual developer and PM incentives? Are risk mitigation disciplines aligned to associated risk (non-compete and non-solicitation clauses for client and associate, facilities management discipline, insurance coverage et al)? Great post! Smart companies identify new strategies to effectively align business structures and processes. Therefore, change is essential. Your focus on structure, producing key metrics, and alignment to best practices is critical. Very informative and valuable to improving overall performance. Tim, I have known you for almost 10 years and I know that you have mastered the management and structure of professional services organizations. Thank you for sharing the core principals that have guided you to success. This is required reading for anyone running a growing professional services business. The tools are all described in black and white. Tim, thank you for this post. This article is essential reading for all I.T. service company principals and investors. I have used your advisory services with two of my “product services groups”. Your management and consulting contributions were transformative. I tell everyone that there is no one that knows the I.T. services industry better than Tim Fargo. What a great job you did of totally turning the Pro Services Group around at SalesLogix! An excellent primer for any new (or existing) professional services organization. In particular, I enjoyed the discussion of staffing models and how you can optimize them within a service delivery context. As a partner at a large accounting firm, this advice is absolutely consistent with how we look at the financial and operating rigor needed to run a successful business. Tim - thank you for taking the time to create and share this timeless and insightful article. Tim, thank you for this great post. It was very informative, especially when comparing a Product Services Group (e.g. product-related consulting leading to product-related service) to a Professional Service Org (e.g. practice-related consulting leading to a variety of related practice engagements). I have seen small PSGs (essentially VARs) go into the enterprise & mid-enterprise with little success due to their product-centric focus. This article nails it when describing the type of prof serv models that the enterprise and mid enterprise require for successful ROI on customer-facing technology implementations. October is not just about pumpkins, fall foliage, and cooler temps anymore. October 2018 also means the exciting introduction of Microsoft Dynamics 365 for Customer Engagement. Back in 2016, Microsoft introduced its intentions to refresh its CRM and ERP strategy with Dynamics 365. At the heart of its services was the Common Data Model (CDM).